The morion helmet was introduced to warriors across Europe in the 16th and early 17th centuries. It became a huge hit among fighters for its level of protection, and the Comb Morion Helmet was particularly favored by both the English and the Spanish. In fact, it was favored so much that even officers and generals came to wear them, although as befitting individuals of high status and rank, their helmets were typically engraved and ornamented to show off personal rank and status. This helmet is one befitting a more common soldier, featuring little in the way of unnecessary decoration and being extremely protective. The helmet features a round crown with angled edges and a curving brim, giving this helmet a hat-like appearance that is none-the-less extremely effective for defense. The crown of the helmet also features a tall ridge, which helps to reinforce the strength of the helmet without adding to its weight overly much. A line of brass-colored rivets runs along the edge of the helms brim, acting as both decoration and as further enhancement. 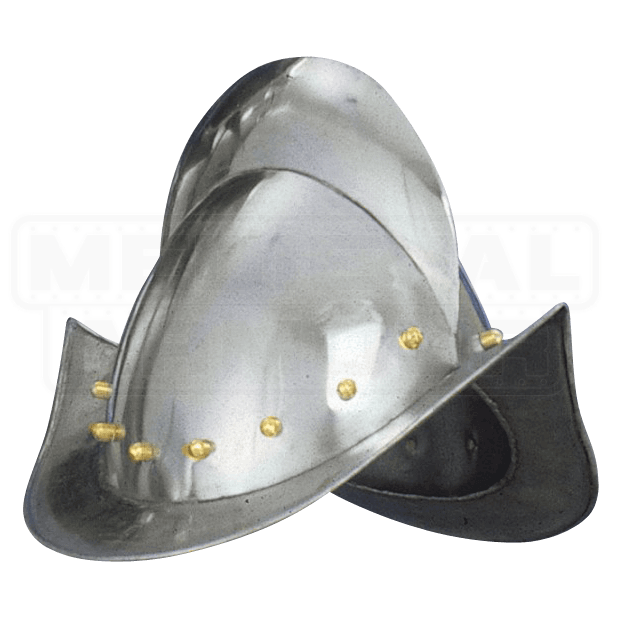 The helm is made from quality steel, making it a great choice to wear whenever you want to make yourself look like a real renaissance soldier. Or, if you happen to be a collector, this Comb Morion Helmet is a great acquisition to have, as it makes a fantastic addition to a wide assortment of medieval and renaissance era collections.